I'm digital too - eight digits (plus two opposable thumbs)! Hey, I know his cousin, Windoz 10. This is not terribly authentic operationally but it is 100% reliable, it's not failed me yet. "I cut it twice and it's still too short"
I forgot to mention in my derision of automation that I did create an automated circuit. I had originally intended it to be for a High Line and may still do yet at some stage. It was created it using EPL components and it all worked very well. I even took it to a friends Garden Party and it performed with perfection all afternoon. All been stuck in a Box since I moved to St.Neots in 2012. Short vid that I made at the party. Here is a link to a more comprehensive one I found in youtube. Certainly if you wish to use automation EPL is pretty easy to set up and easily revised to sort out any problems that you may have. I used EPL too (ioop with 2 passing loops, one hidden so 3 trains alternating plus a branch line with auto reversing unit) but it was analogue - yeah, wires - and not DCC. Mine is a post-Beeching branchline: it's gone! I used one of these. Works well - when a customer wants a train they pay! Ah, silly me. All this time I've been using Custard Pi, no wonder I don't have much success with electronics. I think custard is a semiconductor?? I never got further than an automated shuttle on dc using a home mad etimer circuit and a couple of doodles. It worked ok but I rather like actually driving my garden trains. I enjoy driving trains "hands-on" but I also enjoy watching my automated layout while I'm doing other things in the shed. Nothing too unspeakable. The video clip below shows an example. Forgive the strange mixture of motive power, and the minimalist scenery courtesy of Playmobil. And my feeble attempt at a rollwagen. The software driving this is Rocrail which is freeware with voluntary contributions. Left hand panel shows the status of the locos, and right hand the track occupancy; red is occupied and yellow is reserved or locked. The green and red circles are the track sensors. BTW music playing in the background is Billy Joel, greatest living rock singer songwriter of late 20th century. Der Schuppenbahn, converted for use as the DCC automation project, thus enabling the members of the Area Group with a slant towards the Dark Arts to practise their craft! So much for the "myth" about being unable to mix and match various manufacturers equipment! 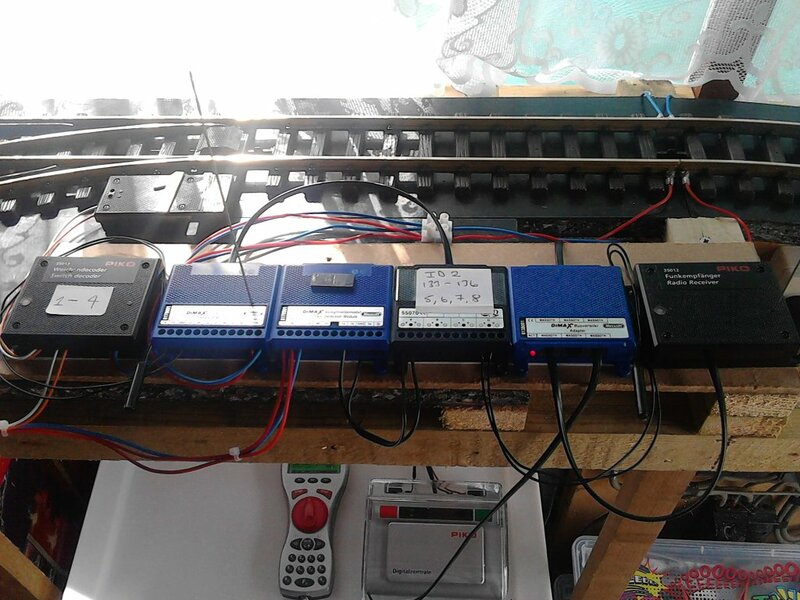 PIKO Switch Decoder, Massoth Wireless Feedback Module (acting as a Master), Massoth Train Detection Module, LGB Feedback Module (configured as a Slave with contact control, see article on GSC), Massoth Bus Expander, PIKO Wireless Receiver. 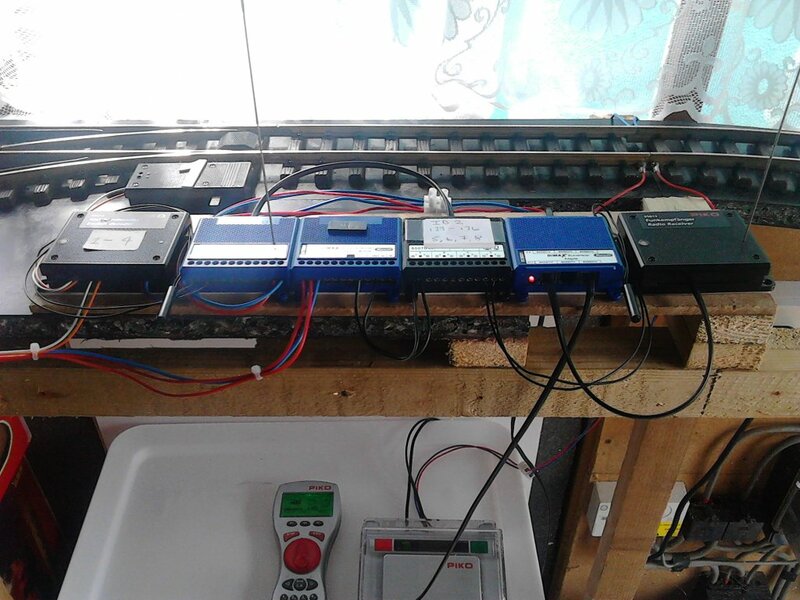 Manual Control (single point select or Route selection) from a PIKO or Massoth Navigator, Automatic Drive and or Switch either using Reed Switches or the Train Detection Module and or combinations of both, and using either or Massoth and LGB Feedback Modules or combinations of both. I still have hopes of using on board battery power with wireless control for the tram fleet (when finally built)! The only other alternative would be the Cut-Rail method of semi automatic control of trams from the UK. One of the big benefits of the cut-rail method if done well is that when the tram gets onto said cut section the other tram starts up and they both run at a slightly slower speed till the original one stops thus giving a feel of proper acceleration/deceleration before a stop/start. Semiconductor ? Work part time on the Trams, does he? If custard is conductive, can we use it as an alternative to graphite paste....? Life Tip: don't mix them up. The grey stuff tastes terrible and ruins a rhubarb crumble. Nice slow running on this setup. So good to see that on a smallish layout, I found it difficult to do on my portable layout. Yes I limit the speed of my locos to scale 35kpm or less which is less than half a metre a second actual (0.43m @ 1:22.5 to be precise). For most of my locos that is about half max speed (15 or 16 of 28 speed steps). Someone mentioned software..... to me, designer software is a 2B pencil. Equally as useless, as they 'blunt' too quick. Real draughtsmen use at least a 4H for good quality work. From the early 80's, running a form of digital automation, using Sinclair ZX 80, 81, Spectrum 128, 128 plus, Acorn Electron from the serial port or joystick port. Introduction of IBM PC, printer port was bi-directional, sort went on from there. Oh! nearly forgot, IBM System 36 main frame, and "borrowed" the use of a Cray Supercomputer! Like what they use to tell the weather, whilst it was being moved from Bracknell to Exeter! Under no circumstances was tinkering with Commodore 64's permitted, formed part of the defence of the realm against impending missile attacks! Present day more into, Raspberry Pi, Arduino based DCC++ Central Stn , SPROG 3, PC Windows 10, Android Phone, PC converted to use X86 version of Android, Massoth, PIKO, LGB. 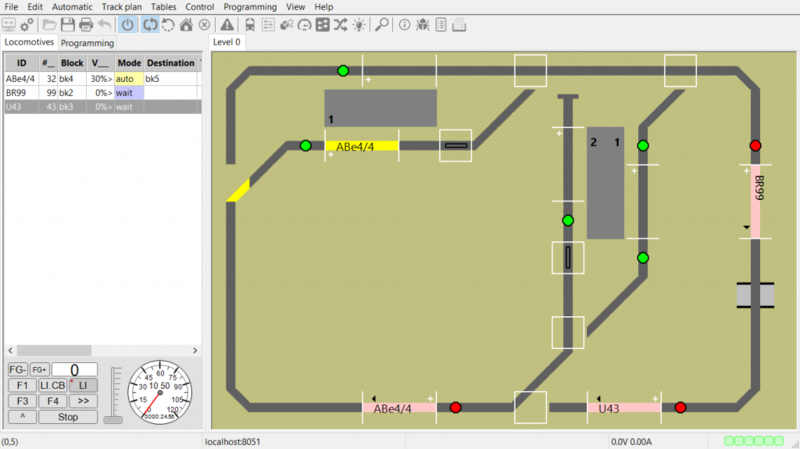 JMRI, Processing 3, LGB MTS PC, Stellwerk Easy, Arduino, Massoth in built Automatic Control. And, that's just for starters! I have been using Stellwerks Software (Direct from Herr Schwartz) and an MTS III central station. I am ready to give up on it because I cannot get consistent reads from track sensors. They work 75-90% of the time and that is too unreliable. I am considering trying an Arduino with a Motor Shield as the controller and DCC++ and JMRI with the hope that this will allow for more reliable reads from the track sensors. Question: Everything I see suggests that you supply DC voltage to the Motor Shield which I assume will be supplying DC to the track. My understanding of the LGB MTS III system is that it supplies AC to the Track for power and signals. Do you have any insight as to whether or not the Arduino/Motor Shield setup will work with LGB MTS Decoders? Do I supply DC input to the Motor Shield and then the Arduino converts that to an AC power and signal to talk to the the decoders? You mention track sensors, which type are you using? Un-powered Reed Switches for example are notoriously bad at producing a consistent read as a track sensor, Dave on his site has details on converting them to be powered, which increases their reliability. Hall Sensors are a more reliable medium, although some more work does need to done for their installation, by far the best and most reliable method for track sensors is to use " current sense detection"